Our mission at Chaska Dental Center is for each of our patients to achieve optimal dental health by providing only the highest level of care. We believe strongly in the correlation between a healthy mouth and a healthy body. We are committed to pursuing excellence through continuing education, personal and team growth, and the mastery of leading-edge technology. It is also our goal to hold firmly the lasting relationships we have established with our patients while looking forward to relationships yet to be built. Our state-of-the-art Chaska dental office features the latest technology and comforting amenities in a warm and inviting atmosphere. We use safe, biocompatible dental materials for restorations and prosthetics that will stand the test of time. Our emphasis on comprehensive dentistry extends to a whole-health philosophy. Dr. Swingdorf and Dr. Meschke believe that great dental work can exist only on a strong, healthy foundation. We will always address your underlying concerns because your needs are our priority. Everyone’s smile is completely unique, and we believe their dental care should reflect that, which is why our team takes the extra time to get to know each and every one of our patients. By just spending an extra 5-10 minutes talking to a patient, we can learn invaluable information about their goals and concerns and immediately have them reflected in their dental care. With that, we can guarantee they have a positive experience while achieving a beautiful smile. 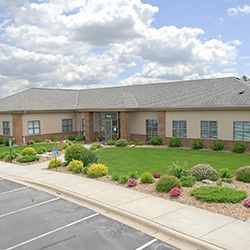 Chaska Dental Center delivers quality care for patients of all ages. We treat patients with any level of concern to promote optimal oral health and beauty. Backed by a team of dedicated professionals, our dentists take a comprehensive approach to patient care. Our practice has been serving the Chaska area for over 70 years, and we’re only getting better. World-class dentistry shouldn’t cause a financial burden for your family, which is why we offer our patients numerous ways to save at every appointment. If you have insurance, we’ll make the process of maximizing your benefits as straightforward and easy as possible. And, we can even offer you hassle-free financing to break up the cost of your care. In the end, we’ll make sure you can always come to see us with peace of mind.